staySky Vacation Clubs is on a roll. A recent expansion has created 88 new jobs at the fast-growing, Orlando-based vacation club. The club made its debut last year and now employs more than 300 people. 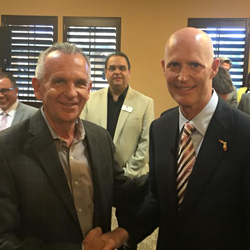 In a briefing yesterday at Lake Buena Vista Resort Village & Spa Orlando, FL, Governor Rick Scott highlighted the impressive job growth at staySky Vacation Clubs, operating under the parent company, Club Trust. Orlando is once again the No. One tourist destination in the United States. The city welcomed 62 million visitors in 2014, up 5 percent from 2013, making it the nation’s first-ever destination to surpass 60 million annual visitors. Orlando's record-breaking visitation produced another record of 32 million room nights sold here last year. Tourism is also Florida’s No. One industry. The state leads the nation in visitors annually. More than 97 million visitors came to the Sunshine State in 2014, an increase of 3.9 percent over 2013. John Gordon, CEO of staySky and Club Trust, said, "Nothing makes us happier than being able to provide our guests with best vacations and service possible, and Orlando has proven to be a great destination to meet those needs. We are proud of the excellent work our team does every day, and we are excited to welcome these 88 new team members to Club Trust. We are grateful to Governor Scott for recognizing our success today, and we look forward to our continued growth in Florida. " staySky Vacation Clubs has four properties in Orlando’s thriving tourist district, minutes from world-class theme parks, attractions, entertainment venues and the convention center. The portfolio includes Lake Buena Vista Resort Village & Spa, ranked among TripAdvisor’s 2014 list of Top 10 Hotels for Families in the U.S. Accommodations at staySky Vacation Clubs properties range from contemporary one-bedroom condos to four bedroom townhouses. With spacious living and dining areas and fully equipped kitchens, the hotels and resorts are ideal for large and small families, couples, groups and travelers in town for extended stays. Generous onsite amenities add to the allure, including sparkling pools, a variety of dining options, fitness centers, game rooms, free Wi-Fi and more. Some properties also provide free transportation to nearby theme parks. staySky Vacation Clubs offers tremendous flexibility. Members also enjoy privileges at more than 3,000 hotels and resorts in top destinations around the globe, thanks to the Club’s affiliation with Interval International, a premier provider of vacation services. Plus, staySky Vacation Clubs offers extended vacation packages, dining certificates and special offers with cruise lines, private yachts and sailboat charters. Members can also opt to spend their staySky Reward Credits on accommodation upgrades, car rentals, attractions tickets, tours, gift cards, a wine club membership and more.